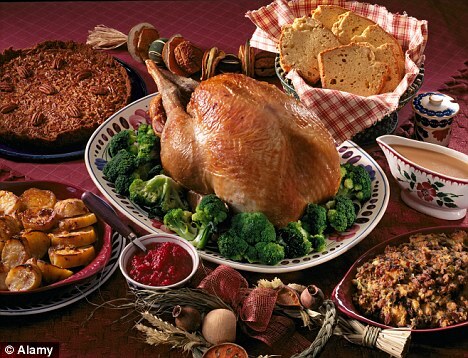 Studies done by the Calorie Control Council shows that the average turkey dinner with all the trimmings can pack a whopping 3000 calories, not including the additional 1500 calories consumed through snacking, appetizers and little nibbles here and there. All mounting up to a whopping 229 grams of fat! Sheesh! Right? But don’t worry. Here are a few tips to help you avoid the battle of the bulge. Plan ahead of time. Create a system or a how to attack the weekend festivities. Eating less and exercising more is the key to averting weight gain during this time. You’re surrounded by family, so make exercise a family activity. Have fun with the added benefits. Skipping breakfast may seem like the key to preserving the calories, but experts say that eating a small meal can actually help you maintain a level head when making item selections later. Eating slower, releasing your fork and having conversations in between each bite will allow your brain to process that you’re full. Eating until you’re satisfied versus until you’re full, will help you maintain control and save your waistline at the same time. Lastly, have realistic expectations. Instead of looking to lose weight during the holiday due to all the obstacles we have to face, just try to maintain your weight. At the end of the day, the most important thing is to enjoy yourself and your family!